"Rhubarb is sweetened and topped with a crunchy oat topping in this delicious and easy to make pie. 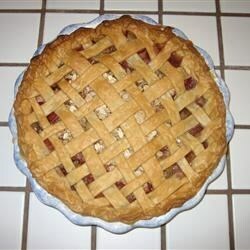 A dear family friend always grew rhubarb and made this pie with her bounty each year. People are skeptical when they hear it is a rhubarb pie without strawberries but after only one taste, they understand the magic of this pie. Serve with vanilla ice cream for added sweetness!" Toss the rhubarb with 1 1/2 cups of sugar and the tapioca in a large bowl. Drizzle with the melted butter and toss again to coat. Pour the rhubarb into the pie crust, and set aside. Mix together the oats, 1/4 cup sugar, flour, softened butter, and cinnamon in a small bowl until evenly blended. Sprinkle the oat topping over the rhubarb. Bake in the preheated oven for 15 minutes, then reduce the heat to 325 degrees F (165 degrees C), and continue baking until rhubarb is tender enough to pierce with a fork, about 30 minutes more. Allow to cool to room temperature before serving. Never ate rhubarb ubtil I moved up north, I loved it. This a great recipe! This was so good! I just used the crumb topping on top, without the pie crust top - perfect! It was tart and not too sweet!